Wolfram Alpha is an answer engine developed by Wolfram Research. It is an online service that answers factual queries directly by computing the answer from structured data, rather than providing a list of documents or web pages that might contain the answer as a search engine might. It was announced in March 2009 by Stephen Wolfram, and was released to the public on May 15, 2009. Wolfram|Alpha's long-term goal is to make all systematic knowledge immediately computable and accessible to everyone. We aim to collect and curate all objective data; implement every known model, method, and algorithm; and make it possible to compute whatever can be computed about anything. Our goal is to build on the achievements of science and other systematizations of knowledge to provide a single source that can be relied on by everyone for definitive answers to factual queries. When Wolfram Alpha was released to the public in May 2009, many people were surprised when it did not function like Google or any other search engine. The reason for this is that Wolfram Alpha is not a search engine, but a computational knowledge engine. Wolfram Alpha is far from perfect at this time, but it is already a tool that may find great use in the day-to-day work of the average college student and is sure to only get better with time. everyone for definitive answers to factual queries. Wolfram|Alpha aims to bring expert-level knowledge and capabilities to the broadest possible range of people—spanning all professions and education levels. Our goal is to accept completely free-form input, and to serve as a knowledge engine that generates powerful results and presents them with maximum clarity. Wolfram Alpha is a system for computing the answers to questions. To accomplish this it uses built-in models of fields of knowledge, complete with data and algorithms that represent real-world knowledge. For example, it contains formal models of much of what we know about science -- massive amounts of data about various physical laws and properties, as well as data about the physical world. Users submit queries and computation requests via a text field. Wolfram Alpha then computes and infers answers and relevant visualizations from a core knowledge base of curated, structured data. Alpha thus differs from semantic search engines, which index a large number of answers and then try to match the question to one.  Data curation: Alpha doesn’t feed off the entire web but rather works off a managed database and certain trustworthy sources (Alexa and US Census info being among them). Data which does not change is managed and categorized whereas the sources are polled regularly for relevant, up-to-date information.  Computation: 5-6 million lines of Mathematica spread across lots of parallel processors (10,000 in the production version) make up the heart of Alpha. They collectively encode a large segment of the algorithms and computer models known to man. They can be applied to theoretical problems (ie, integration, series creation, airflow simulation) or to specific data (weather prediction, tide forecasts etc). 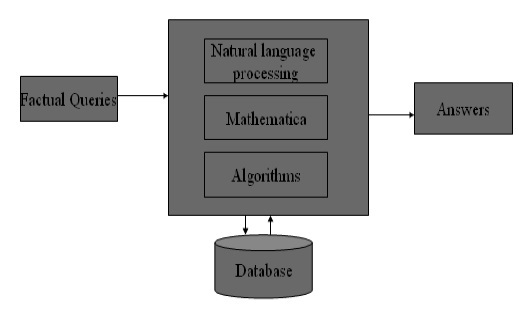  Linguistic components: The demonstration makes it clear that their is a very powerful (though far from perfect) natural language processing system at work. This freeform linguistic analysis is essential to Alpha because without it, a manual to make proper use of Alpha would be thousands of pages long (according to Wolfram).  Presentation: Alpha is very pleasing to look at. The information is shown in a way that makes it very easy to get a good grasp of what’s being displayed but isn’t overwhelming at all. Though there is a standard overall format (individual data segments are arranged into ‘pods’ on the page), the actual displayed is very tailored to the specific query. It is actually simple enough for a child to use. Alpha focuses on questions that have definite answers or that have answers that can be computed directly. In cases where there is confusion or dispute, or Alpha cannot compute sufficient answers, there will be the option of sidebar links to additional resources (like Wikipedia). Talking about Wikipedia, Alpha won’t be open for everyone to contribute to, however Wolfram said that there would be a smooth process for experts to contribute to Alpha’s knowledge base.